Do you remember this gate? I blogged about it in 2014. 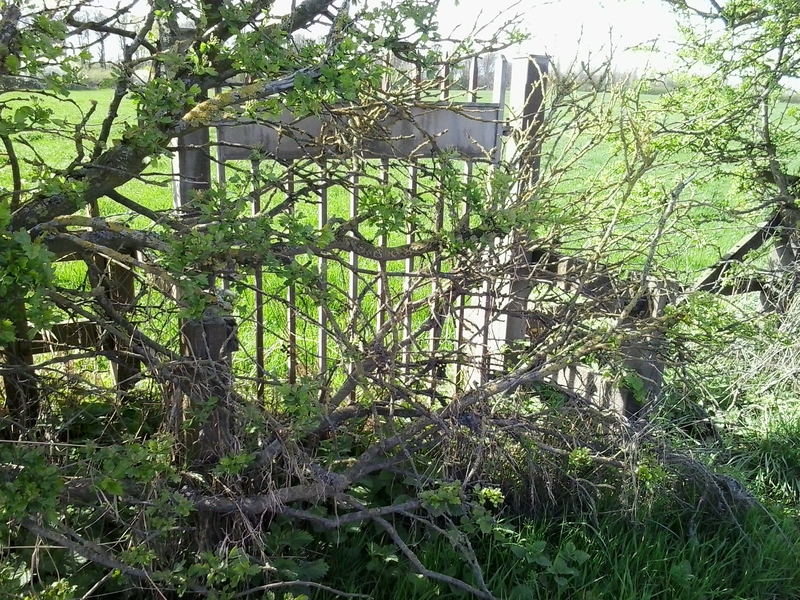 A locked gate in the hedgerow; leading to what? 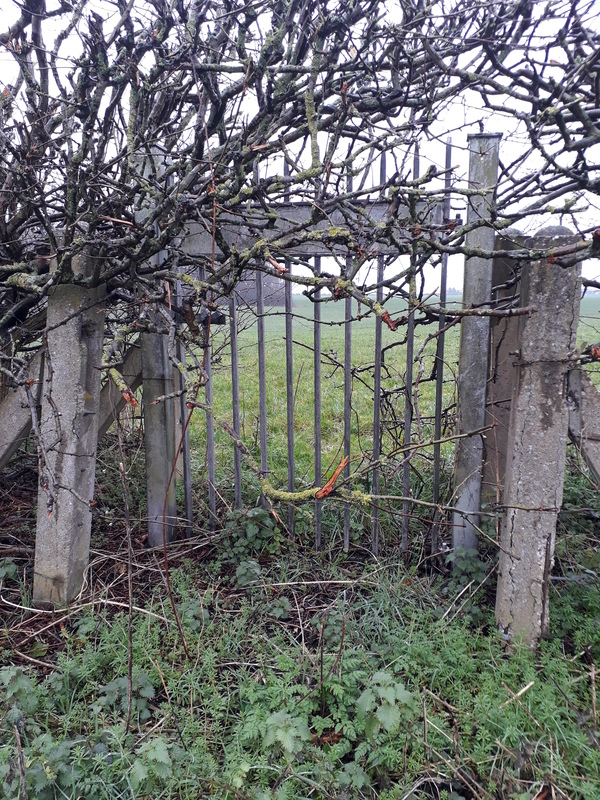 This gate, and its matching cousin on the other side of Brimstage Lane, has remained a puzzle lurking at the back of my brain. One day I’d understand why it was there. I just needed to find some time for a bit of research first. Fast forward to mid February 2019. 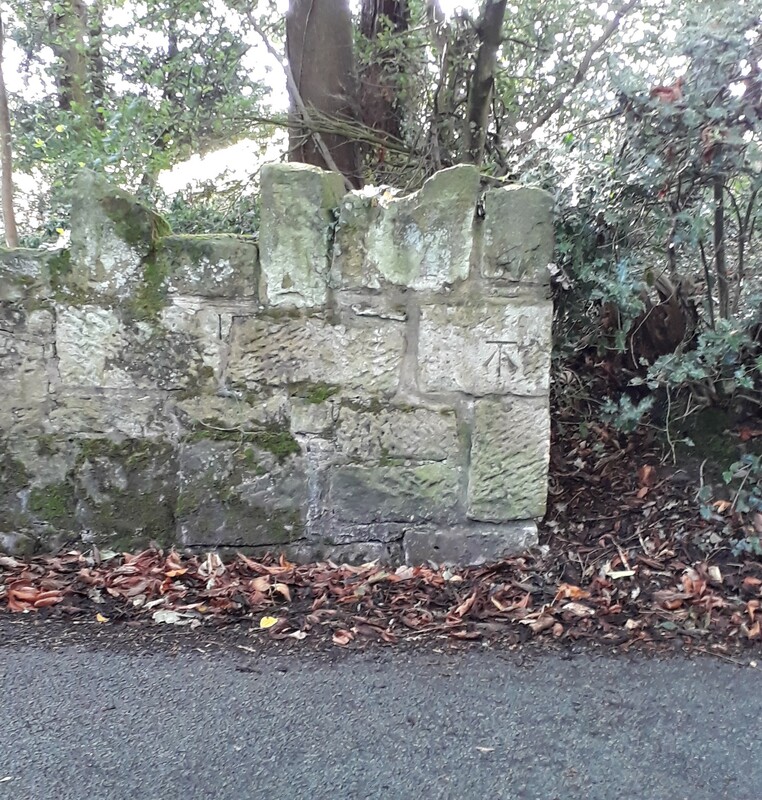 A lovely sunny Spring-like day and I took the afternoon off work to go for a bike ride and bag a couple of Wirral flush bracket benchmarks – SJ 3129 8198 and SJ 3216 7502 if you’re interested. Clatterbridge roundabout is scary on a bike at the best of times and particularly intimidating during the Friday afternoon rush, so I hopped off my bike to push it on the footpath and – blow me! – if there wasn’t another one of those gates in the hedge! You can see it here on this Google Streetview from 2009 You can just about make it out through the undergrowth on the 2016 Streetview if you know where to look. I’ll go back and get my own photo at some time. This one wasn’t locked and there appeared to be some sort of utility inspection hatches beyond the hedge. 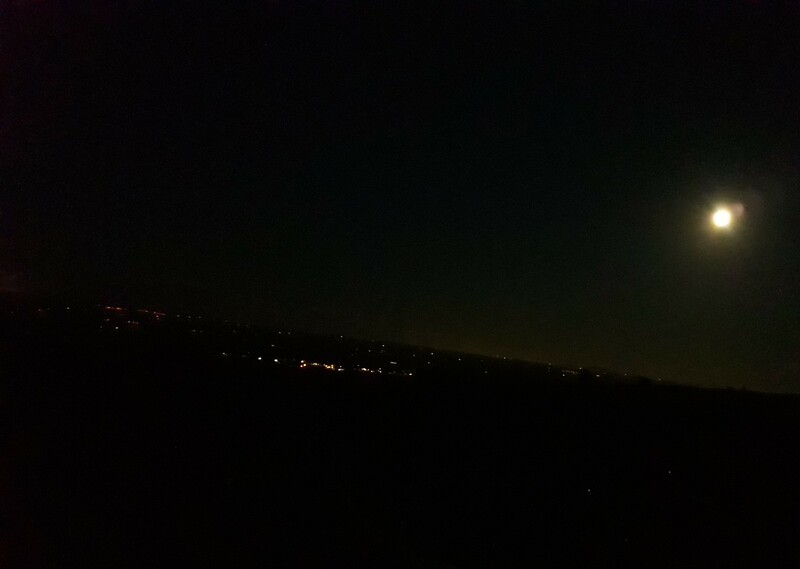 However, with the light fading and my backside aching after my first long bike ride for a couple of years I didn’t investigate any further and continued my journey home. The Cheshire Tithe Maps webpage is a ginormous time sink and I love it! Focussing on the area between Brimstage Lane and Clatterbridge roundabout, I looked at the historical maps for any hint that there used to be some sort of path, track, road etc that could have connected those gates. Bits of path sort of matched what I was looking for, but something wasn’t making sense. The gates were new. By “new”, I mean they were made out of metal and it would have been a peculiar ancient thoroughfare that had completely faded from modern view but was significant enough to warrant metal gates. I was puzzled and my head hurt. But….. hang on….. what’s this? 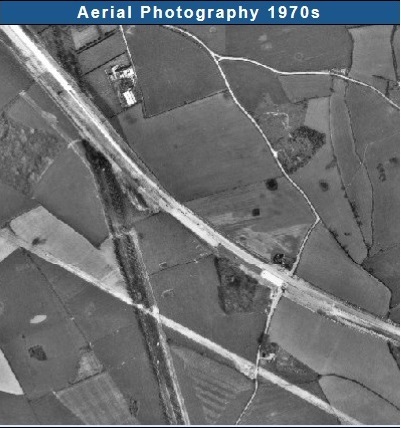 The 1970s aerial photos seemed to show something running in a straight line between Brimstage Lane and Mount Road near the roundabout and hospital. Some sort of ground disturbance which, if my estimation was correct, ran in a perfectly straight line between the two gates. Yay! I’m on to something. Here’s a segment of aerial photo showing the M53 motorway under construction [top left corner to bottom right] and one of the Leverhulme estate causeways [running NNW / SSE] which still exists. 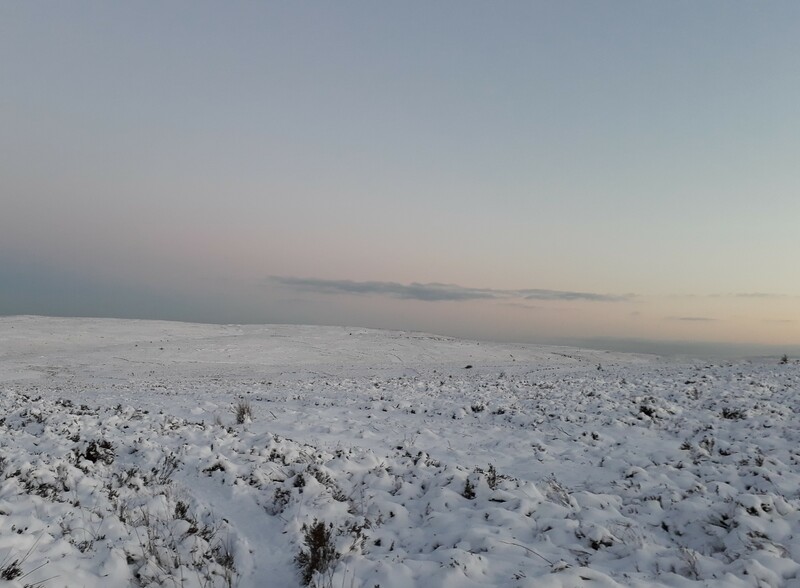 The white scar running from the middle of the left edge of the photo down to the bottom right crosses Brimstage Lane just south of Keepers Cottage and appears to be in the right place to meet the gate at Clatterbridge roundabout. The tithe maps website only shows a small chunk of map or aerial photo at a time. If I zoomed in, I could see detail but lost the context. If I zoomed out, I could see the bigger picture but could no longer identify exactly what I was looking at. To see the whole picture I was going to have to print out segments of the aerial photo and stick them all together. So that’s what I did ……. Piecing together the evidence. Computer, various paper maps, scissors and sticky tape. I could now see that the ground had been disturbed all the way from Thingwall to just outside Ellesmere Port. Running in straight lengths across the fields and along the railway for part of the way. When I say Thingwall, I mean the Crosshill covered reservoir. Apparently it has a Trig Pillar and Flush Bracket but I’d not been able to get into the site to bag it a week or so earlier. Now, if you’re like me, you may have just read the word “reservoir” in connection with a long, straight ground disturbance and not put two and two together. However, if you’re more like my work colleague, Chris, you’d have thought “Erm, could it be a water pipe?”. Ding! It was as if a light had been turned on. Of course, it’ll be a water pipe! I double checked what was at the Ellesmere Port end of the “thing”. Ha! Sutton Green Water Treatment Works! Grateful for Chris’ logical thinking (but kicking myself for not spotting the obvious myself) I was now pretty confident that my gates were something to do with a water pipeline that ran between two covered reservoirs but I needed evidence. On the wettest Sunday so far this year I went and checked a couple of places where the “pipeline” intersected roads. I found another gate. 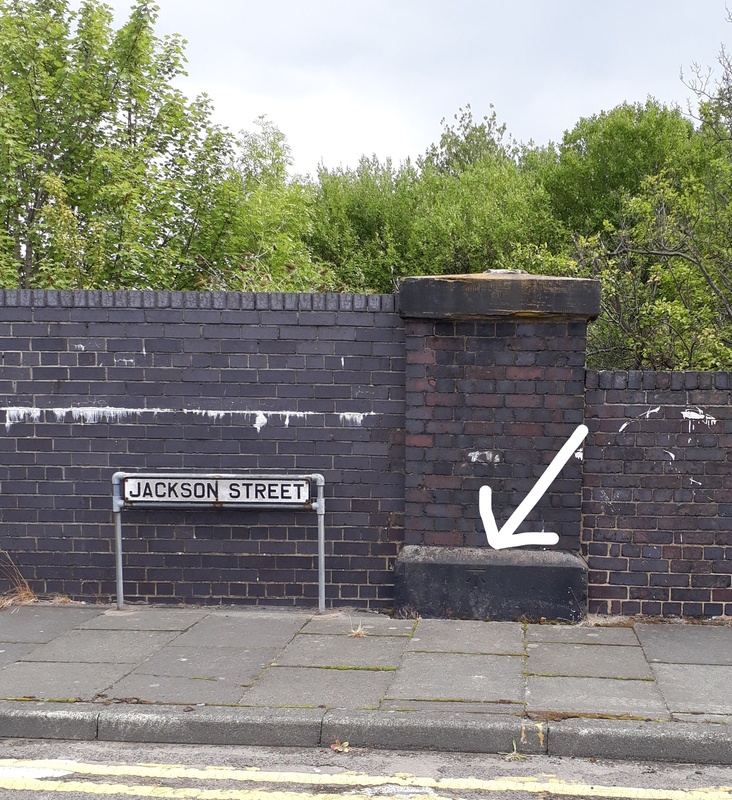 This one is on Station Road, SJ 293 841. And next to this gate was this little beauty…..
I’m assuming (yes, ok, hoping) that WW stands for Wirral Water. The Wirral Water Board became part of North West Water in 1973. North West Water later became part of United Utilities. I also walked up the causeway, on Leverhulme estate land, shown on the aerial photo above. I found no gate, but there is a concrete stile in the right place. The pieces of the jigsaw were now coming together nicely but I still needed some documentary evidence to confirm my deductions. Pipelines don’t just appear; they are planned, budgeted for and laid. There must be a record of the work. I searched the internet for “Wirral Water Board minutes” and found, via the National Archives, that 10 years worth of minutes – 1963 to 1973 – were held in the Wirral Council Archives. I gave them a call and arranged a visit. The archives staff were very helpful and, after a short anxious delay when it appeared the minutes may have been transferred to the reference library, I was soon sitting with a pile of blue bound minute books. The minutes are indexed … in a fashion, so – starting with the July 70 to June 71 minutes – I looked for any reference to Crosshill reservoir. Bingo! Minute 21 dated 15 Jul 1970 described how easements had been paid for the laying of a 36″ main from Sutton Hall to Crosshill. I switched to the previous year’s minutes and found minute 194 on 18 Feb 1970 decribed the impending completion of the new 36” main between Sutton Hall and Crosshill. This was exactly what I wanted to find. 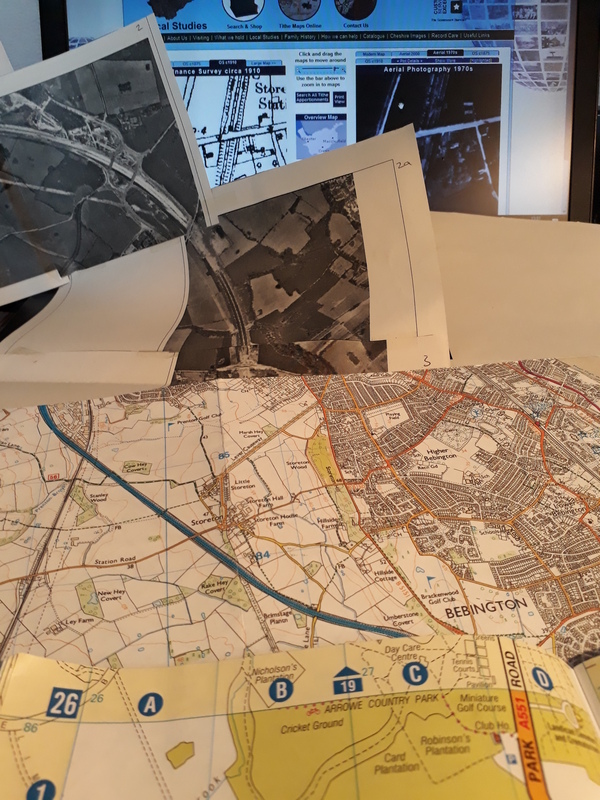 At the time that the aerial photographs were taken, Wirral Water Board were laying a 36 inch water main between Crosshill, Thingwall and Sutton Hall (Sutton Green being the nearest named place on most maps). This is enough detective work for now. I’m happy that the gates were probably linked to the laying of the water main in the late Sixties / early Seventies. Why was the water main required? Did one reservoir keep the other topped up? Is it common for reservoirs to be linked? Why were the gates required? They are only personnel sized, so you couldn’t drive a digger or pipe-laying machine through them. Was regular inspection required after the main was laid? Will the rest of the WWB minutes yield any answers? There are only ten slim volumes so I’ll go back at some point and read them all. 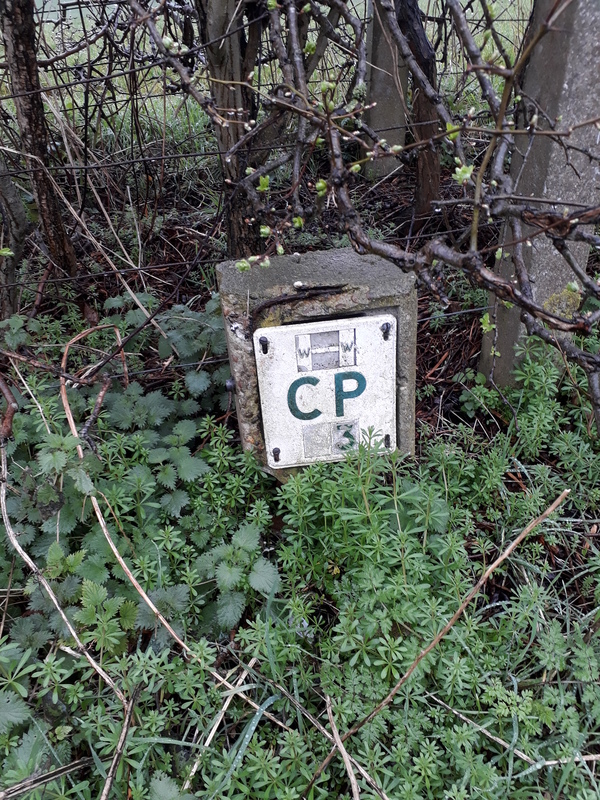 What does CP mean on the utility marker on Station Road? Cathodic Protection? Can I bag the Trig Pillar / Flush Bracket which is within both reservoir sites?! Both sites are secured (especially Sutton Hall water treatment works) but maybe a polite letter to United Utilities may do the job? When I take part in the TGO Challenge I do a LOT of planning. Partly because them’s the rules; but also to avoid being stuck somewhere with no idea of how to get where I need to be. This trip was not like that. Although my blog is primarily a personal diary of my trips and experiences, I hope it also serves an educational purpose in showing when it can be useful to have A Plan (or even just A Clue). With two and a half days available between Tranmere Rovers’ home games I packed up my winter bivi gear and caught a train to Chirk. From there, I hoped to catch a bus to Llanarmon Dyffryn Ceiriog but I could not figure out, from the timetable, whether the bus was running. Also, I did not know how long it would take to change from the train to the bus so I caught the early train to make sure I had plenty of time to catch the bus …. that might not be running. 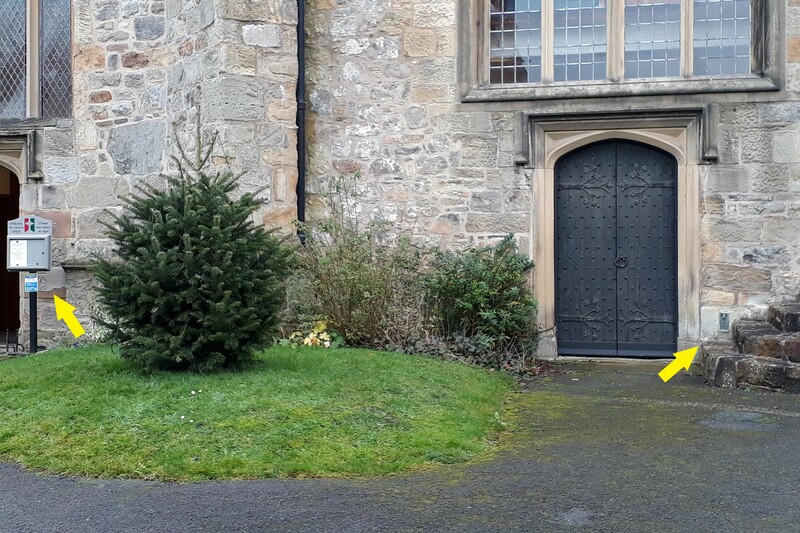 Arriving at Chirk I realised that it took less than a minute to get to the bus stop (straight up the steps onto the road) but which bus stop? One went towards Llangollen and the other, just round the corner, towards Llanarmon DC but both had the timetable for both directions and no “Buses towards xxxxx” sign. I worked out which stop I needed and checked the timetable…… which was abundantly clear: only one bus each day was School Days Only, not every bus. I now had 50 minutes to wait for my bus; plenty of time to find a benchmark. 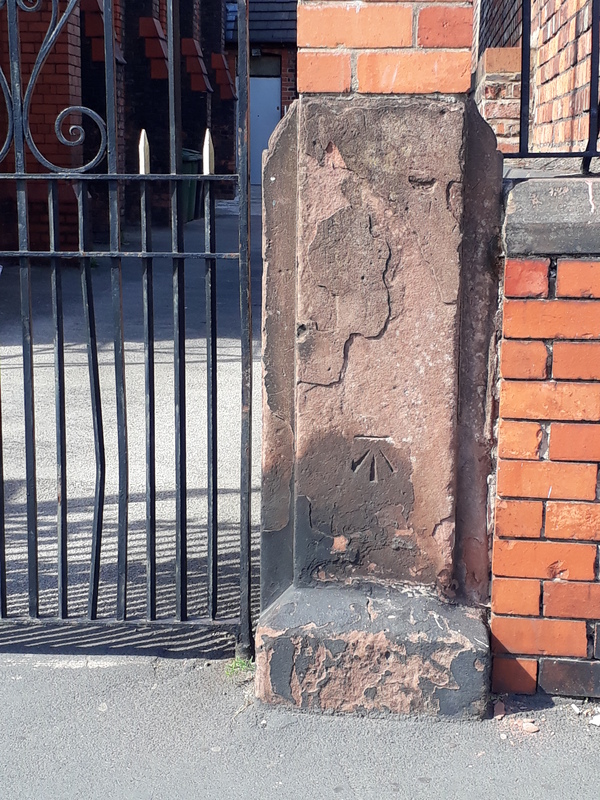 Eschewing the one on the railway bridge I went to St Mary’s church where I was rewarded not only with the Flush Bracket I was expecting but also with a cut mark with bolt. Pleased with these easy pickings I popped into the Spar for a coffee and bun and waited for my bus. The bus was on time and took me along the B4500 through Glyn Ceiriog and to Llanarmon Dyffryn Ceiriog. 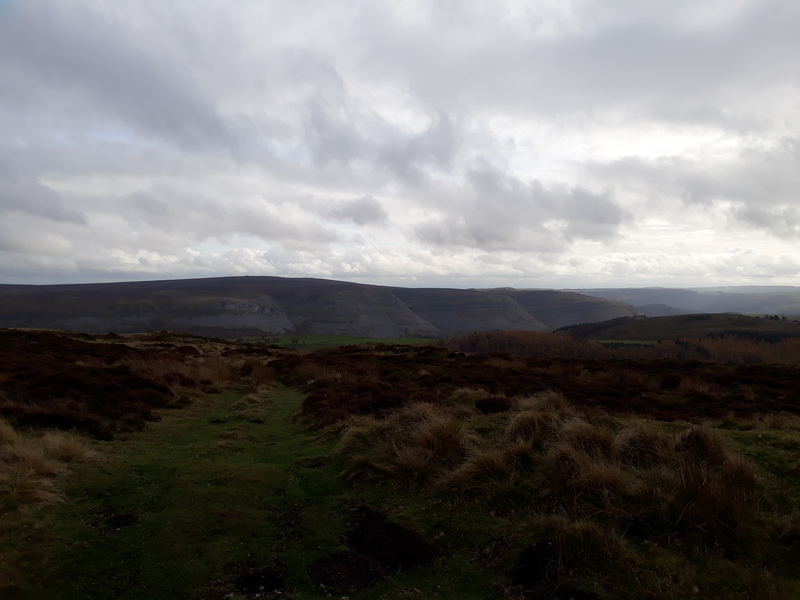 I lost my phone signal soon after leaving Chirk and wondered if this might be an offline trip. You know, the way it used to be when we just went somewhere and did things and only told anyone about them when we got home? Llanarmon DC has a couple of pubs so I stood outside one for a final dose of wifi then took the road south out of the village and picked up a footpath going West. 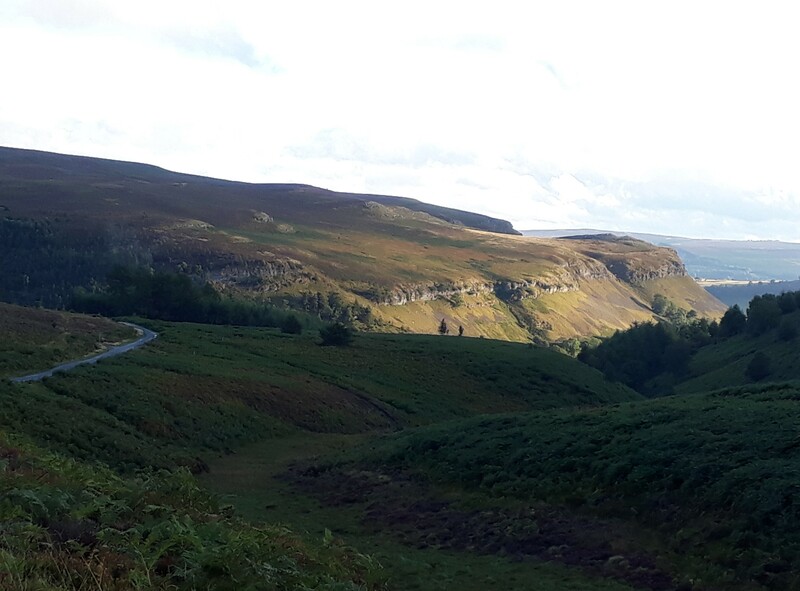 I planned to follow paths and green roads to get as close as I could to the Cadair Berwyn / Cadair Bronwen ridge before it went dark. The countryside was very pleasant. Rolling and green, not too challenging but with just enough climb. 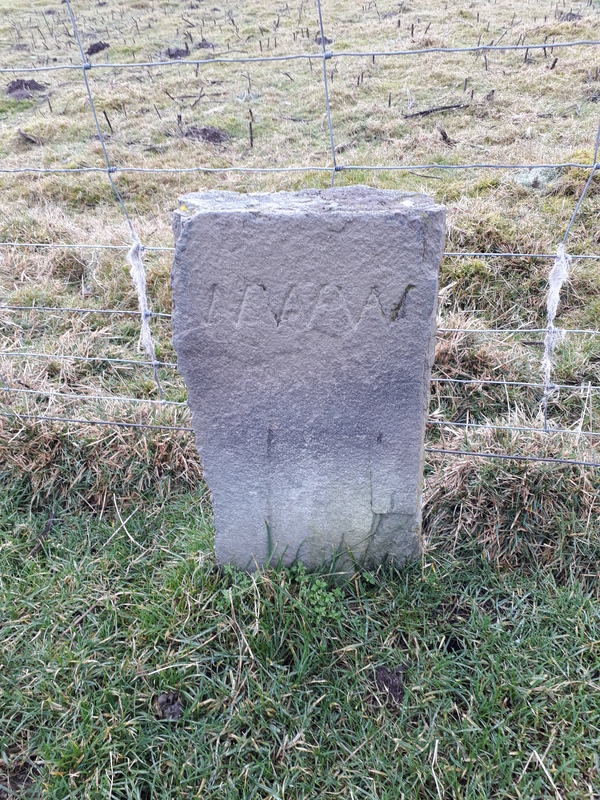 From Mynydd Tarw I followed the county boundary marked with a fence and occasional boundary stones. By 3:30pm I was looking for somewhere to camp. Ideally I would want my shelter pitched by 4pm as it would be dark by 4:30pm. 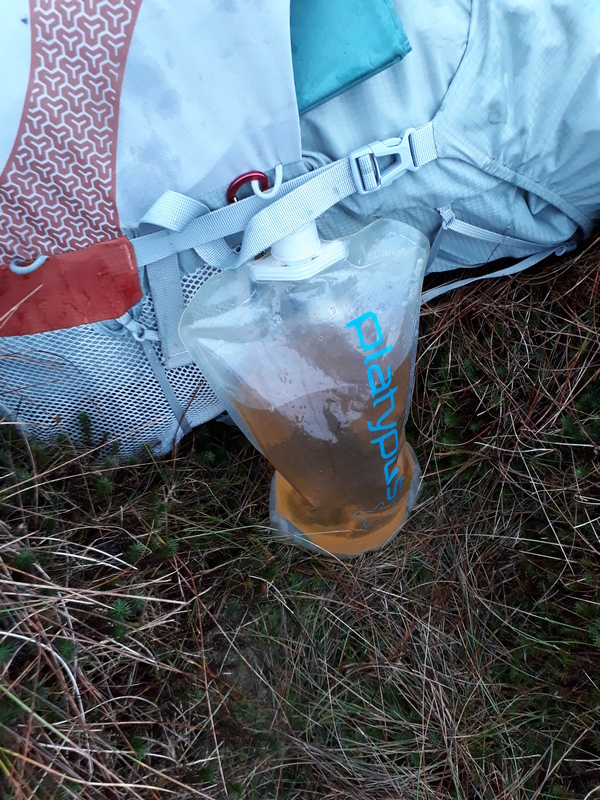 I’ve learned over the years that my pitching location options are enhanced if I collect water before I camp. That way I don’t have to find a good pitch which also has water nearby. 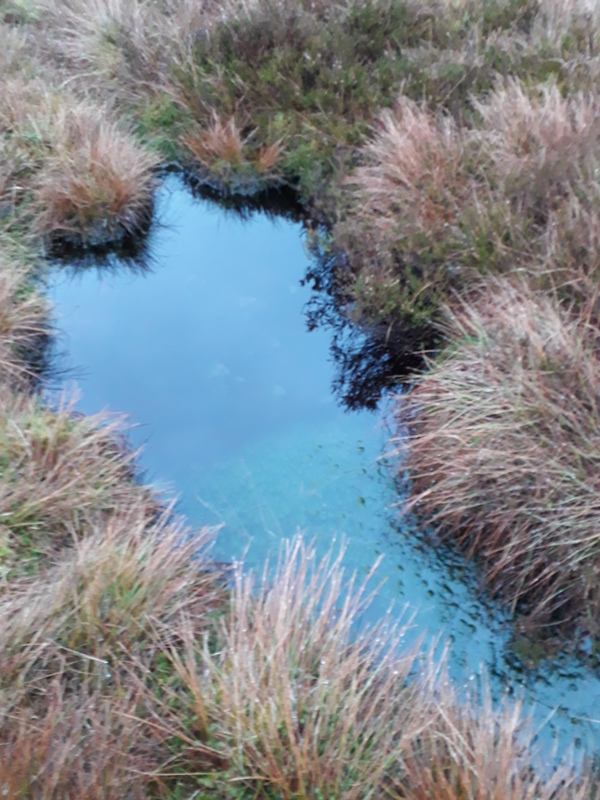 I had not seen any running water for a while but I found this tasty looking puddle and I filtered a couple of litres of it – although even the filtered water looked like weak tea. 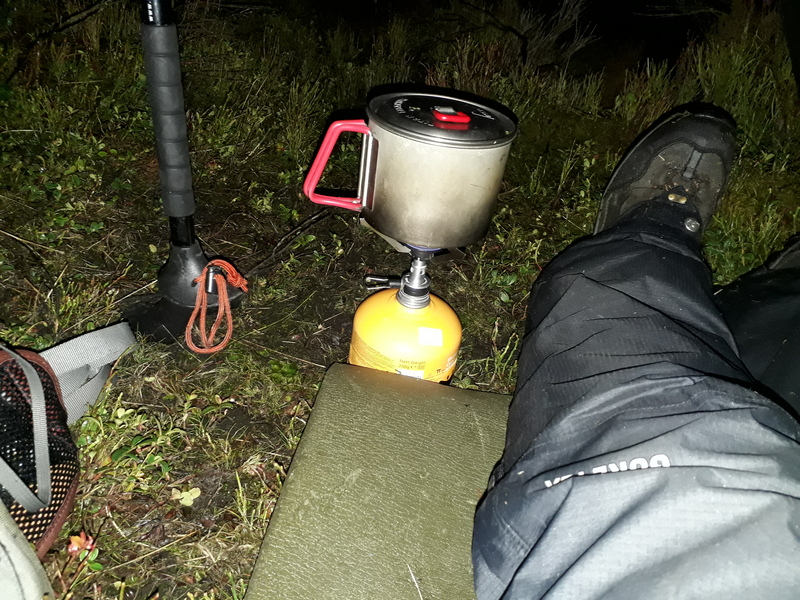 I like sleeping “out”, ie not just in an enclosed tent but actually outside. In the winter I am not going to be pestered by midges so I can use an open shelter. I could just sleep in a bivi bag but, if it’s raining, it’s not very pleasant to spend 18 hours of darkness sealed up in a bivi bag; a tarp allows a far more pleasant evening under cover but with a feeling of openness. I’d originally planned to take my Rab Survival Zone bivi bag and my Backpackinglight.co.uk micro tarp but, in the end, decided on the greater coverage of the Rig 7 and the lighter (probably less waterproof) Moonlite. The weather forecast predicted cloudy skies rather than rain but I knew it was likely that low cloud would be blown under a smaller tarp. I also took my warmest sleeping bag, my Tundra Pure -10, and a foam roll mat to sleep on. I pitched in what I will call an “envelope” configuration, although I have no idea what other people call it. I’d planned this set-up before I went away and it (mainly) worked well. 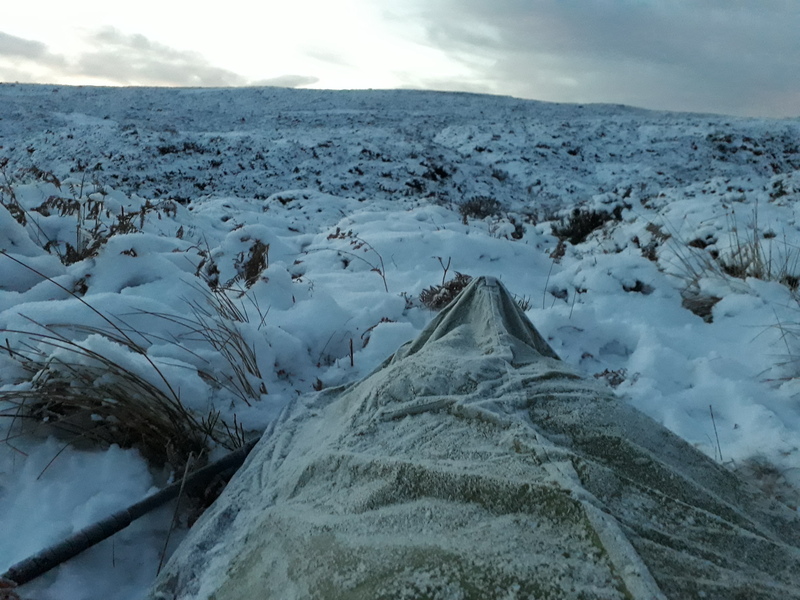 I tucked one quarter (70 cm) of the tarp under as a groundsheet; had half of it as a lean-to, and the remaining quarter as a beak over the open side. The groundsheet was not wide enough to sleep on but it meant I had somewhere clean and dry to lay out my things. It also had the unexpected benefit of being less draughty than if I had just pegged out the end of the tarp, although this may have been because there wasn’t a lot of wind. I also pulled out the flat body of the lean-to by using a guyline attached to one of the lifters; this has the effect of making the large flat tarp less billowy and gives more living space underneath. Sitting up under the tarp I had plenty of space to change clothing, cook & eat and I had good views out of both ends. Lying down, though, was when this design reaped most benefits. I had excellent views on the three open sides. I could see to the horizon and, although I was disappointed that it was a cloudy night with no stars, the tarp was giving me the experience I had hoped for. 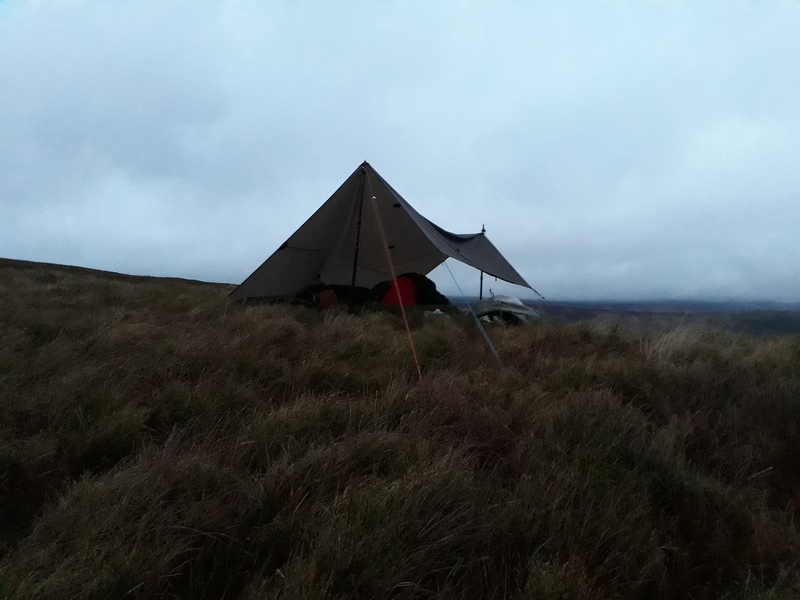 There was one slight problem in that I had not quite pitched the lean-to into the wind and, when it started to drizzle, I was getting puffs of wetness coming in from that end…. where my head was. This was easily fixed by rigging another short guyline which pulled in the end of the tarp slightly. I could do this from bed and it only took a minute. The wind got up overnight and, in the early morning, I realised I would have to do a few quick modifications. I lowered the pole at the foot end, tightened the guys at that end, and rigged another tie-out a quarter (60 cm) of the way in. This kept everything tauter while I was making my breakfast. 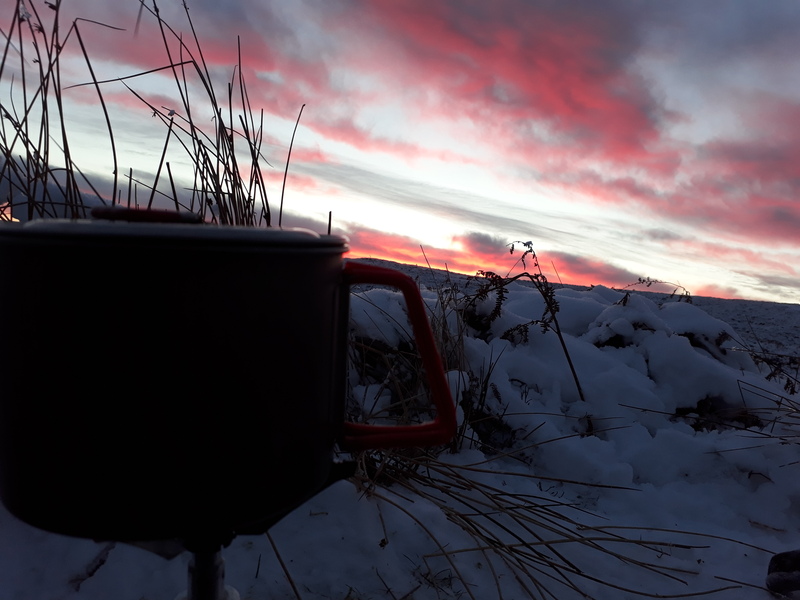 Something that really puzzled me was why I could no longer sit up to drink my coffee ….. until I remembered I’d lowered one end of the tarp and could now only sit up at the high end! I had a leisurely breakfast and it was around 9:30 before I was packed up and ready to walk. 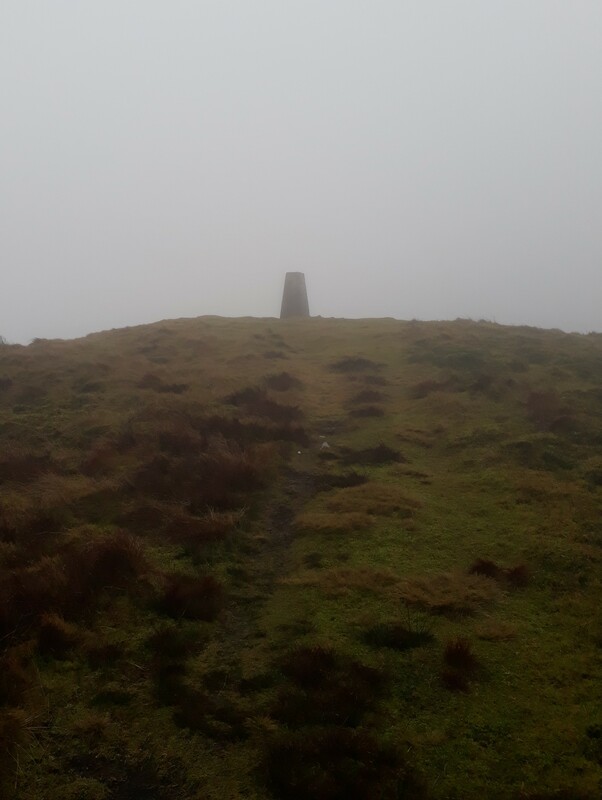 By this time the mist had descended and I’d lost sight of Foel Wen, my first hill of the day. A couple of years ago there were stories in the news about young people, and some not so young, stepping in front of traffic and falling off cliffs whilst blindly following their mobile phones in the hunt for Pokémon. “How foolish!”, I thought. 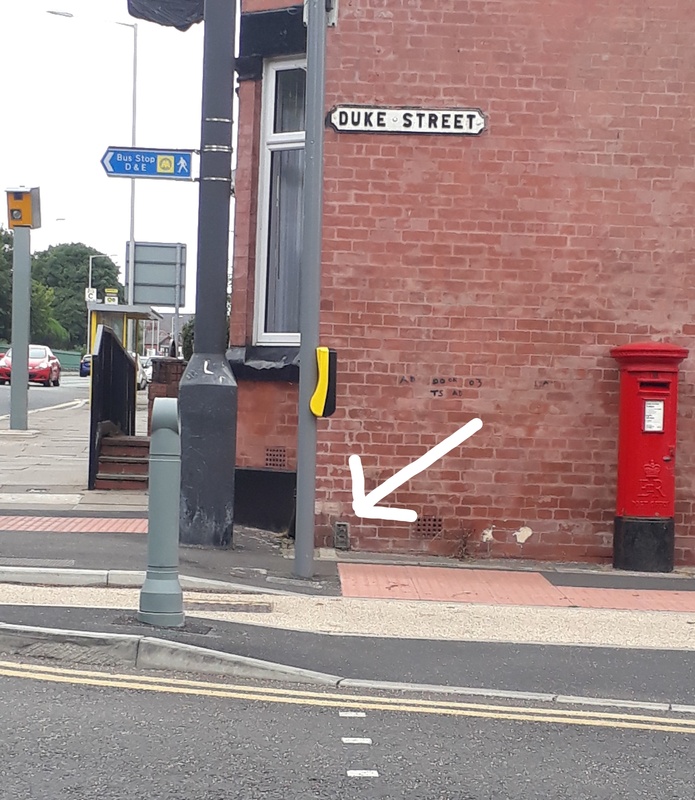 However, I now find myself wandering the streets, phone in hand, searching – sometimes fruitlessly – not for Pikachu and its chums but for elusive signs of a bygone technology. I have become mildly obsessed with finding Ordnance Survey Benchmarks. I’ve been aware of BMs for a long time. Occasionally I’d spot one and I suppose I did know they had something to do with measuring or surveying or something-or-other but I’d never realised how many there were and what a huge effort it had taken to create and manage the network. A short evening walk had piqued my interest in how the local area had developed in the last century. Looking at old OS maps on the National Library of Scotland webpage I noticed how many BMs were marked. I tweeted about my observations and was surprised to receive a reply from the OS telling me about the legacy list of BMs. Good grief! There’s over half a million of them . . . . .or, at least, there were although they’ve not been maintained for 50 years and many have been destroyed. Not only is there a csv file containing every single Benchmark (apart from the Fundamental ones which are still maintained by the OS and therefore, I presume, a possible source of income) but they are also viewable as an overlay on OSMaps (Tick the Benchmarks box under Places). Wherever I am, so long as I have a data connection on my phone, I can bring up a local map which shows the position of every benchmark. Touching the benchmark icon brings up a description of where it is. You do not need to be a paid subscriber to OSMaps to see the benchmarks overlay or to use the basic mapping or aerial view. Unfortunately, this overlay is not available on the OSMaps mobile phone app. I have asked the OS about this but it sounds like it’s a long way down their development priority list. The wall faced NE-ish but I can’t figure out what angle could be referred to. In the last month I have found and photographed 29 benchmarks. 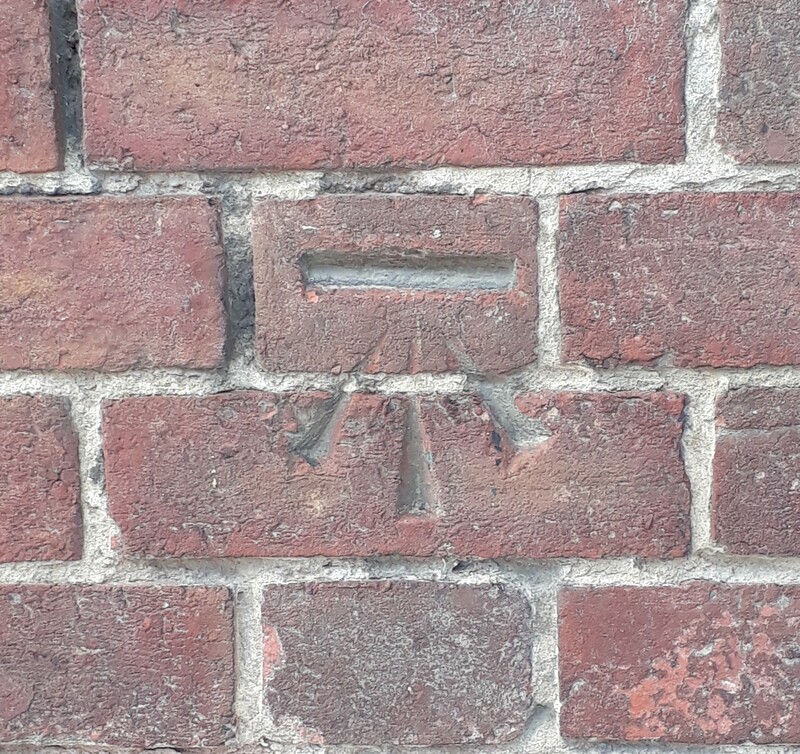 Most have been cut marks, ie the distinctive arrow head, but there has been 1 flush bracket; the Park Road North / Duke Street one above. I had always assumed that the flush bracket I saw on a hill-top triangulation pillar, ie trig point, was a key part of the trig point. In my ignorance I had no understanding of the different purpose of a trig pillar (surface distance) and a benchmark (height above Ordnance Datum / sea level). 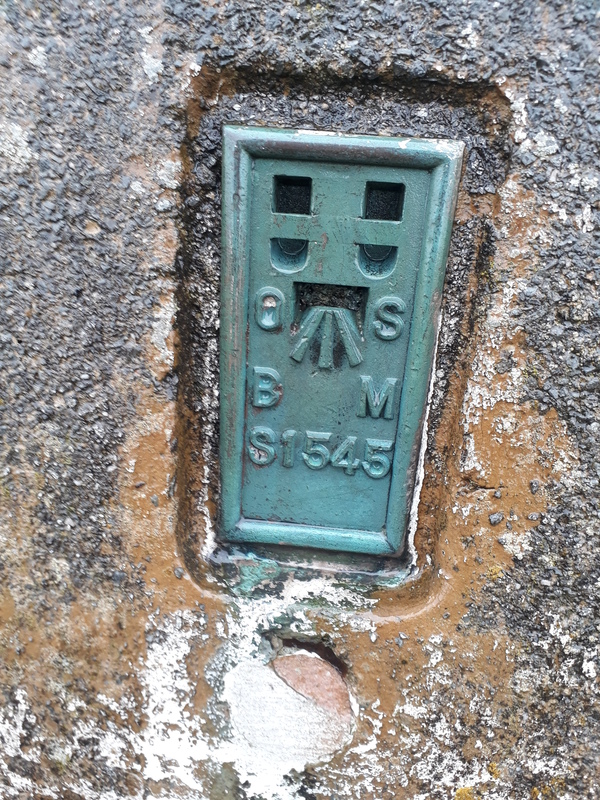 All those photographs I’ve taken of trig pillar flush brackets over the years can now go into my Benchmark collection! What I would like to do is catalogue every benchmark I have found. 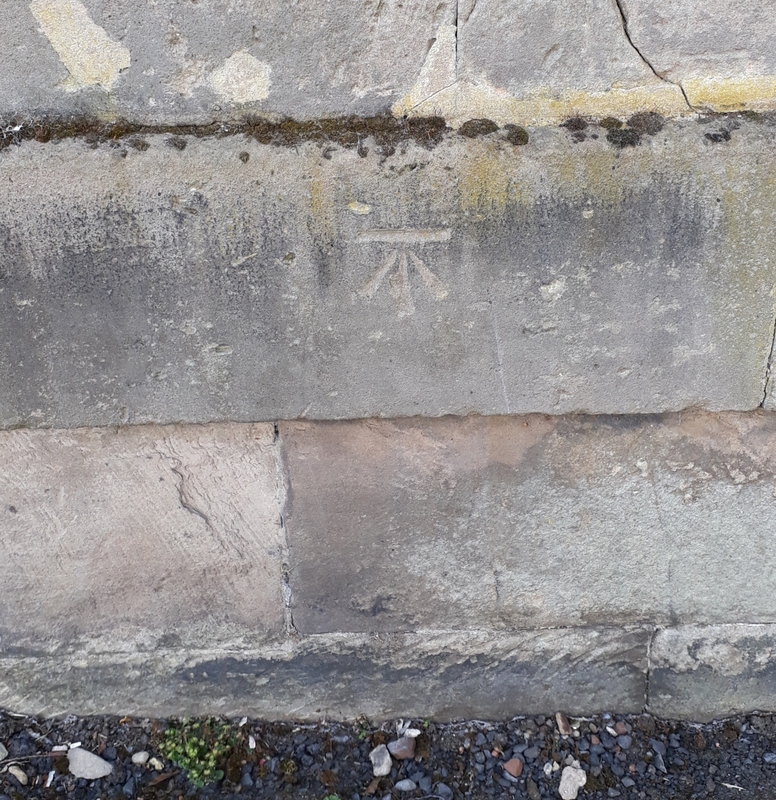 It needs to be ticked off a list and have the date of discovery noted along with a photograph and a description of the condition of the mark. Of course, it is equally important to record the ones which I’ve looked for but couldn’t find…… and there have probably been over 20 over those, so far. I’ve dallied with a few different ways of recording my finds. An online map would be perfect but I’ve not yet found a way that seems to do the job in the way I would like. I am geotagging my photos, so it should be possible to put them on a public online map, but I’ve not yet found the best way to do it. I could also upload them to Geograph but I’d like a simple way to only display the BM photos on a map and I’m not sure if Geograph can do this. Of course, no hobby – however strange – is ever new on the internet and I know there are communities of BM-baggers keeping and publishing their own records. I’ll probably contribute to https://www.bench-marks.org.uk/. You may have noticed that I’m quite passionate about these weird wall-scratchings. People collect all sorts of odd things so I mustn’t beat myself up over being a Benchmark Bagger. It doesn’t hurt anyone and it gives me a good excuse to go for a walk at lunchtime or in the evening and see what I can find. I’m also enjoying looking at old OS maps to work out where a missing BM used to be. It’s free, it’s harmless and it’s interesting …. and if you’re reading about benchmarks for the first time I bet you’ll have to have a little peak at OSMaps to see where your nearest one is.